New Selection of Great Sparkling wines with which to enjoy 6 excellent bottles of sparkling wines with an exceptional discount of 10%. You can enjoy different wineries of the territory such as Gramona, Recaredo, Raventós i Blanc, Juvé i Camps ... Do you want to miss this great opportunity? Foamy emblematic with structure, creaminess and freshness. Sparkling that expresses depth, transparency and freshness. Sparkling estate, fresh, elegant and pleasant. Sparkling of exceptional character and great complexity. Sparkling pink body that hides soul of white. Sparkling with long aging, round and with character. 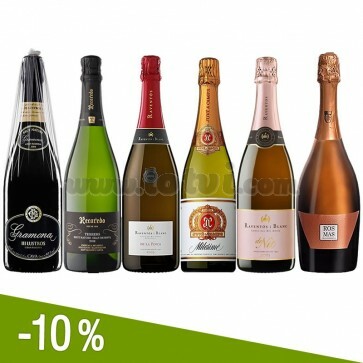 Do not be the last to enjoy this great selection with a discount of almost € 11!